Don't Destroy Your Laminate and Hardwood Floors by Steam Cleaning! Believe it or not, steam cleaning your flooring is still a very popular method of cleaning your hard surfaces. Unfortunately many people have not really taken the time to research the effect that it will have on your hardwood and laminate flooring. Don't fall for the infomercials! We have all the information you need to know right here. Most flooring companies are strongly opposed to steam cleaning your laminate flooring, and with good reason. Although laminate flooring is capable of handling a bit more moisture than hardwood surface flooring, you can't just inject moisture directly into it and expect it to be peachy keen! 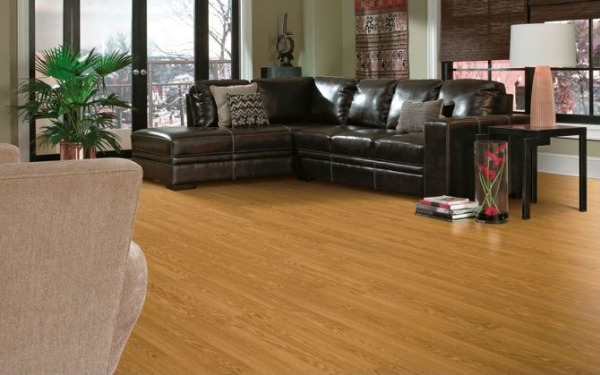 If we look at the installation process, we will see that adhesives are used in most cases where the laminate flooring has a joint locking mechanism. Unfortunately, adhesives never really hold up well to moisture, so steam will do everything it can to break your flooring apart in this case. But wait, even if your particular laminate flooring did not require an adhesive in installation it is still very possible to damage the joints of your laminate. In many instances after repeated steaming, the excessive moisture will actually cause the edges of the planks to peak and swell. Even though you may have tried it and the steaming seams to do a successful job at maintaining your laminate flooring, it will inevitably ruin your flooring. If you have researched how to maintain your hardwood flooring, then you surely have read that any kind of moisture is BAD. When steam cleaning your hardwood flooring, you are clearly in direct violation of this hardwood maintenance code. Moisture is bad for your hardwood flooring because the flooring will soak it up, this happens more so when steaming than letting water stand on it! After a bit of excessive moisture absorption, your boards will swell, buckle and discolor. Eventually it will break down the finish and your in for a heap of trouble and a substantial repair bill. Even if you have Engineered hardwood flooring, it will make no difference to the damage that your flooring will endure. Don't buy into cleaning fads without getting the facts from the manufacturer of what you are cleaning. Usually their directions are the best directions... They did make it after all!